When away in the caravan there are a number of activities that can be enjoyed to pass the time, unwind or invigorate the mind. I recently started a subscription to Audible. Where for £7.99 a month I get a credit each month that allows me to download to my phone, tablet or Kindle an Audio Book from over 200,000 titles. The library is vast. And apart from some old favourites I have previously downloaded – there are some great titles that the whole family can enjoy. Sitting outside in the warm sun, listening to a great whodunit or hilarious comedy is a perfect way to unwind. It’s the imagination that does the work, painting the colour of the rooms, the backdrop and the characters while my mind is taken away from everyday drudgery and stresses. Crikey, its wanting me to take up a new audio book right now. 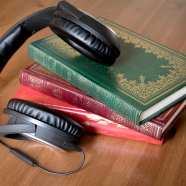 If you want to experience Audio books for yourself, then you can take advantage of the 30 day free trial of Audible and download any of the 200,00 titles in the library, just follow the link below.